The Bills Tab is where all your bills and recurring billers are kept. The list of recurring billers scrolls horizontally along the top, and the list of bills is below that. Tap on one of the recurring billers and you'll be presented with options to edit the Billing Cycle or delete it and all it's unpaid bills. Money Pilot makes it simple to create a one time bill or recurring bills on a wide variety of recurrence patterns. Tap the "+" button to get started. You'll be presented with a form to fill in and set up the bill and its frequency. Start by giving the bill a name, then choose the account it pays out of. Next choose the Payment Type from the defaults or create a custom one that suits your use case. Pick the due date of the bill, or the first due date for a recurring biller. Next fill in the payee, and choose an expense category from the defaults or create a custom one. Fill in the amount of the bill or an estimated average for recurring bills. You can always adjust the amount of individual bills later. You can add a URL to bills or billers to provide easy access to them online. Finally choose how often if at all the bill should reoccur. When your done Money Pilot will create bills for the next year and, if you've added you pay day cycle, group them based on the pay check you'll need to pay them from. Money Pilot makes it quick and simple to record your bill payment transactions into your accounts. 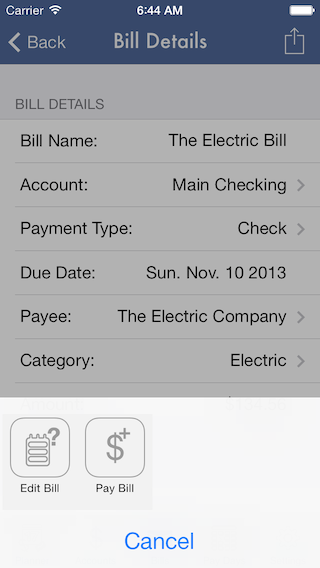 Tap a bill from the list and you'll be presented with a detail view of the bill. Tap the action button in the Nav Bar and you'll be presented with otions to edit the bill or create a transaction record for it that marks it as paid. Choose Edit Bill and the bill editor opens for you to make any needed changes. Tap Pay Bill and the Transaction Editor will open with a transaction filled out for the bill. Make any needed changes and hit save and the bill will be marked as paid and you'll find a transaction recorded for it in the designated account. To delete a bill just swipe it in the list. In the settings tab you'll find the Auto Pilot options. When enabled any bill that is of Transaction Type "Auto Pay", can have transactions created for you automatically when you open the app on or after the due date.